Sift flour into a large bowl, add the yeast, sugar and sea salt and mix to combine. Create a well in the centre of the flour and pour in olive oil and ½ of the water. Mix together with a wooden spoon to combine. Pour in remaining water and form into a dough. Turn out dough ball onto a lightly floured bench and knead for approximately 5-7 minutes until dough springs back when pressed. Form into a ball and place into a lightly oiled bowl and turn to coat. Cover bowl tightly with cling film and place in a warm place for 1 hour, until it has doubled in size. Line a 20cmx30cm baking dish with greaseproof paper. Using a fist, knock the air out of the middle of the dough. Turn out onto prepared baking tray and gently press out into the baking tray until 1 inch thick, stretching out to the corners. Press your fingertips into the dough to form dimples. Press in herbs and olives into the dough. Drizzle with 1 Tbsp. olive oil and sprinkle with a pinch of salt. Allow to sit in a warm place for a further 30 minutes to prove. 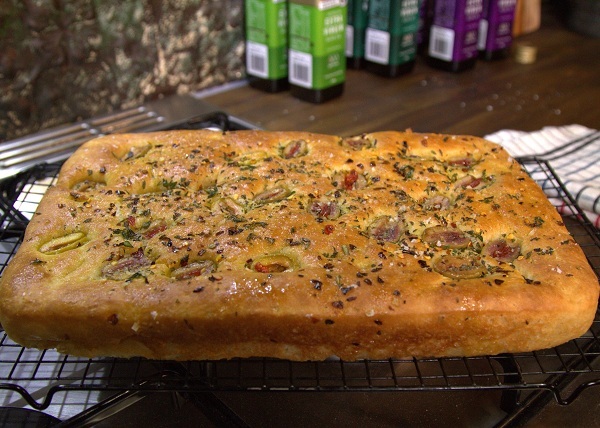 Heat oven to 200C (fan-forced) and place focaccia in to bake for 20-25 minutes until golden and crisp. Remove from oven and transfer to cooling rack. Serve with olive oil for dipping.